An aristocrat who found exile from the storms of the French Revolution in the United States, Saint-Mémin became an artist, pressing a former gentleman's pastime into a profession. From 1793 until his return to France in 1814, he traveled through the States and the newly acquired Louisiana territory, making profile portraits with the aid of a mechanical device called a physiognotrace. This machine allowed the artist to trace the sitter's profile with precision onto paper. Saint-Mémin sold his portraits as a package that included a life-size drawing, a miniature printing plate, and several impressions of the tiny prints, suitable for mounting in a locket or a small frame. 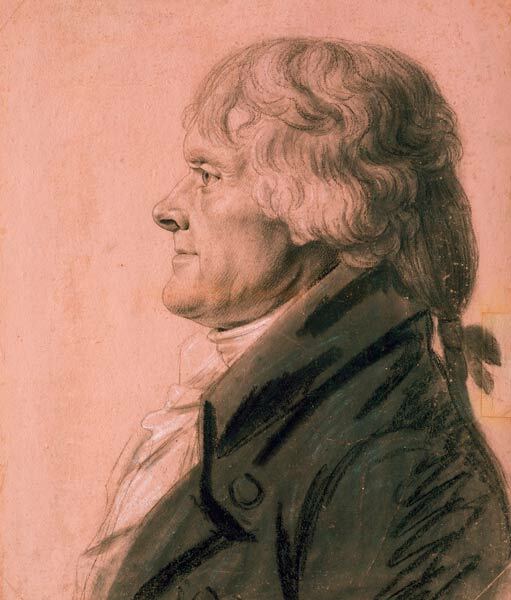 President Jefferson sat for Saint-Mémin's portrait when he was sixty-one years of age and nearing the end of his first term in office. This image of the famous statesman and architect of the Constitution has become renowned as an accurate likeness. It has often been used by the federal government on postage stamps and savings bonds.